The Storemate range is not just our smartest storage solution but it also looks fantastic in any backyard. The Storemate 53 is 1.76m x 1.07m and 1.265 high. I am a very happy owner of a recently supplied Slate Grey Storemate S53 from CheapSheds which I installed to accommodate an existing pool filter and pump arrangement. I think the design and manufacture of the unit is brilliant and I congratulate Spanbild who were responsible for its creation. I had looked at other units and found the S53 to be better designed and made. My installation was made somewhat complicated by its location which is approximately 300 mm away from the rear fence. I realise that every install has its peculiarities and you have to be flexible at times and make decisions on the spot that are practical. I am 64 and not adverse to doing DIY jobs around the house and this was my first shed construction. I love the S53 Storemate and would not hesitate to recommend it and CheapSheds who are very customer service focused to others. Their attention to detail in communications ( Michelle and Chai) with the customer at all stages of the acquisition and after sales service was very impressive - Chai had no hestitation in getting involved to sort out some anomalies for me. Spanbild need to seriously edit their Assembly Instructions – the version shipped with my unit was Revision 10/09/15 - as I came across many time consuming mistakes in that publication. I have sent Spanbild an email notifying them of these for consideration for furure editing. I was fortunate that my pool equipment could be housed within the 1070 mm depth – Spanbild may wish to consider offering a 1200 mm model to allow greater flexibility even if it includes a centre channel for the sides. My installation has a 20 mm front and back clearance from pipes and filter, so I was lucky. Originally I thought I may have had to extend the back by adding a wooden rear wall. I didn’t think the installation was “Quick & Easy” per the coversheet – I took two days in very Brisbane hot weather and I was fortunate to have the assistance of my son for Day 1. Big thanks to Cheapsheds - I found the online videos on YouTube very educational and informative. This is a well managed company. No hestitancy in recommending to others. I was wondering how hard it was going to be to assemble - there were mixed reviews about ease of assembly. However, I found the instructions to be the best I have encountered, with comprehensive illustrations and tips, and only a little 'Chinglish'. I was able to assemble this completely by myself in spite of the instructions stating that two people were required - probably this statement was more applicable to larger sheds. The shed came in a narrow pack of loose panels. Each side wall and the roof was assembled out of a number of smaller panels and edge channels. The shed would have represented greater value for money and quicker assembly if the side walls and roof were prefabricated, or at least available as an option for the less talented or those for whom time is an issue. The assembly was straight forward, with little to no issues with alignment of the screw holes provided a little care was taken. I found that a pair of G-clamps was invaluable to hold channels firmly in alignment while fastening. A small rectangle of metal to stop the channel getting crushed by the G-clamp was helpful too. The only assembly issue that I found was that the support strut bracket on the lid had holes that were slightly too large for the pop rivets supplied. One day I'll get around to replacing the rivets and using some washers on the new rivets to properly clamp the strut bracket. There was no shortage of screws in the pack, unlike some cheap sheds with low quality fasteners and where you only get one spare! First of all, CheapSheds seems like a good online retailer. Helpful when some panels needed to replaced when damaged by the transport company. As for this shed, it is a nightmare to assemble and the result is only okay. The instructions are woeful, how hard is it to spell check for a start? I know this doesn't really matter when you are assembling a shed but it is indicative of the quality of the instructions. The steps for putting together the different components are arranged poorly, not one after the other like every other set of instructions that has ever been written, but all over the place. A lot of patience is required and a lot of drilling! As for the final product it is okay but not really worth all the effort. 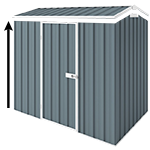 If you are purchasing to store bikes like those shown in the pictures do NOT buy this shed. Bikes do not fit that well in the shed, I would suggest getting something longer. Also, the hasps and the plate the bolt fixes onto are flimsy and the shed could be popped open by a thief very easily. For me it's okay because my bikes aren't that valuable but I will be bringing them inside when I am away overnight. A so-so shed that is hard to put together, I would advise that you look at something else. Good service and great communication. However, I needed to travel to Mainfreight in Abury, 110Km from home base (a one hour trip each way) to pick up the product. It turns out that Mainfreight do have an agent in Wagga Wagga (the biggest inland city in NSW), a mere 33Km from home base. When I made the original inquiry on delivery I was told that there was no agent or depot delivery option for Wagga Wagga. I retrieved this information from the depot by simply asking. Had to follow up on delivery but I think this was caused by Mainfreight, not Cheap Sheds. Other than that I picked up the shed at the depot and all went very smoothly. Once assembled, the product is as described and very practical. My only negative was the assembly instructions which in places are ambiguous and difficult to follow. Not a show stopper by any means, however some DIY skills helped to decipher what was required. How wide is bottom frame. Are your measurements from outside edges of bottom frame or inside edges. Do your pool covers come with bolt down kits or can they be brought if not included in price. Is it lockable? There seems to be 2 ways that it opens so I am not sure how it would lock?